Heavy rainfall caused Sproat Lake Landing to experience flooding over the past several days. The River Forecast Centre is maintaining a flood warning for the Somass and Sproat Rivers and surrounding tributaries and creeks near Port Alberni. In a post on social media, Hugh Braker, Tseshaht emergency preparedness committee chair, wrote that the Somass River is full and that there is no capacity for the river or the lakes to hold more water. The River Forecast Centre estimates that the flow of the Somass on Tuesday was 900 cubic meters per second and the maximum flow on Wednesday was 1,115 cubic meters per second. “In light of the additional rain, the River Forecast Centre is predicting that the flow on the Somass will be between 1,130 cubic meters per second and 1,300 cubic metres per second on Saturday. That will be the highest flow on the Somass so far this year and higher than 2014,” Braker wrote. With more storms predicted for Thursday and Friday, Braker says to expect more and greater flooding in the lower McCoy Creek area, lower Watty’s Hill and Hector Road. He also said to be prepared for longer road closures on Hector Road, McCoy Lake Road and Pacific Rim Highway from Watty’s Hill. The recent heavy rainfalls in the Alberni Valley have caused water levels at Sproat Lake to rise greatly creating flooding in the area that some residents haven’t seen since 1992. McEvay said over the past couple of weeks he’s noticed the lake rise about 8 feet. On Wednesday during a reprieve from the rainfall, McEvay took advantage of the clear skies to take out his aluminum boat on the lake to search for his neighbour’s kayaks that were loose on the lake. On his travels he noticed many homes that were experiencing flooding. “There’s people who have had places out here for a long time; they kind of know what’s going to happen. They know their basements are in danger,” McEvay said. 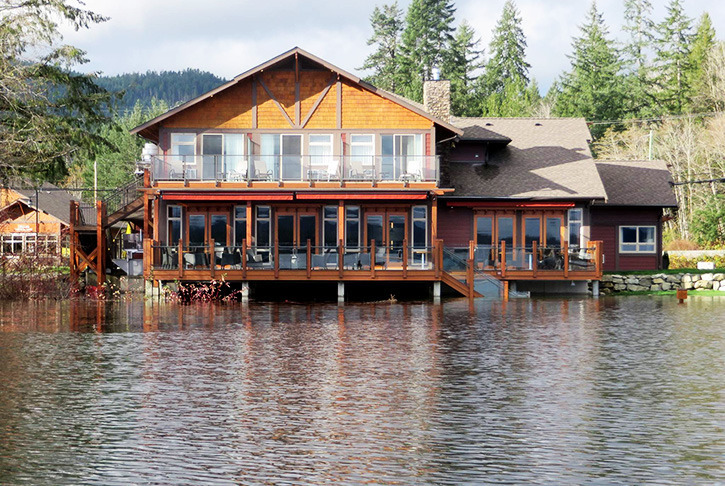 With many folks only living at Sproat Lake temporarily or owning vacation homes, McEvay said they may not realize potential damage that can occur to their homes or property from Alberni rainfall. Preparing himself for what he calls “monsoon season,” McEvay aims to bring his boats up, clear his wharf and beach by mid October to prevent damage if flooding should occur. Tall Timbers Holiday Park and Sproat Lake Landing have also experienced high levels of flooding over the past several days. An estimated 50 to 80 mm of rain is expected for the City of Port Alberni and up to 150 to 250 mm for the surrounding mountain areas beginning Friday afternoon.